Miss the string trees? No way! 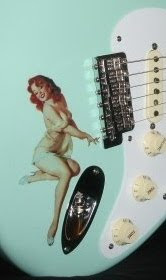 Lovin' the Eric Johnson Dakota RW Strat! The deep Dakota Red finish goes great with its bound rosewood and tinted maple. Maybe an anodized pickguard would look nice, but otherwise this one is cool just the way it is. Fender's EJ models have lightweight alder body, nitro finish & quartersawn necks with the soft "V" '57 profile-- however, to prevent trippin' over any Cliffs of Dover, just move over Rover, let that 12" radius take over. Fender's "medium-jumbo" frets are size equivalent to Dunlop 6130 (.106x.036). Just know that the "jumbo" refers to the width, and not the height considering that 6105's are .045 high, and 6100 is .058! So Fender should probably drop the word "jumbo" altogether. Click Here for fret size refs. Another thing to know is that the RW's pickups are the same as the maple EJ models, including the bridge pu. Some of us heard those EJ interviews where the man himself says otherwise, but the inside story from very good sources (not NTSA intern quality sources either) let us know that after MANY bridge pickup alternatives were tested for the RW, they ended up back with the original. So ALL EJ's, utilize the same bridge pickup. More than you wanted to know about the Eric Johnson Strats? Well, ok. Ummm... Still no string trees, and a blonde case. Willcutt Guitars of Lexington, KY (eBay Store) currently lists the Dakota EJ RW pictured above.